NextThe Australian Perspective: The Fall of Singapore. The Vietnam War remains to this day, one of the most exhausting and controversial wars Australians have fought in. In Australia, as was the case in the United States, it very quickly became an unpopular war. The war was the cause of great social and political unrest and dissidence in Australia. Many soldiers at the time were treated badly by the Australian public and often came home to a hostile reception. Today, we hope that time has healed many wounds of the past, including the wounds between both the Vietnamese and Australian people and respective governments. Whether or not we can call the soldiers who serve in Vietnam heroes is still sometimes up for debate. In spite of that, all servicemen Australian and Vietnamese should be remembered, as we remember all those who fought and died in all conflicts around the world. To make any sense of the South East Asian conflict we would have to go back to the roots of colonialism. Nevertheless, Australian involvement and support for South Vietnam in the early 1960’s was based on ideological policies around stopping the spread of communism in Asia. The South Vietnamese government in 1961-62 had repeatedly asked for support against aggression from the north from the US and its allies. It was provided principally from the United States, with Australia committing 30 military advisers in mid 1962. By early 1965, the situation had deteriorated to the point that the South Vietnamese could not defend their interests and the US commenced a major escalation of the war. In the years that followed the “TV” war embedded itself so deep in the fabric and psyche of American political and social life that still today we can feel the effects of it. One of the early defining battles of the Vietnam War for Australians was the Battle of Long Tan. It was Australia’s most single costly engagement of the war even though, during its decade long involvement in Vietnam, there were more incessant and larger battles. No one had envisaged that Long Tan would be remembered as one of Australia’s most dramatic and intense battles. Some military historians claim that Long Tan was as epic as some of the legendary engagements Australian soldiers participated in at Gallipoli during the Great War and the campaigns of the Middle East, Singapore and Kokoda during the Second World War. In the months leading up to Long Tan on August 18th 1966, the Australian armed forces had established a military base in the infamous Phuoc Tuy Province, where the Viet Cong had long dominated the region going back to the French Indo-China days. The Viet Cong were absolutely determined to keep a hold of this region, but it was the Australians main focus to prevent them from regaining control or the upper hand. 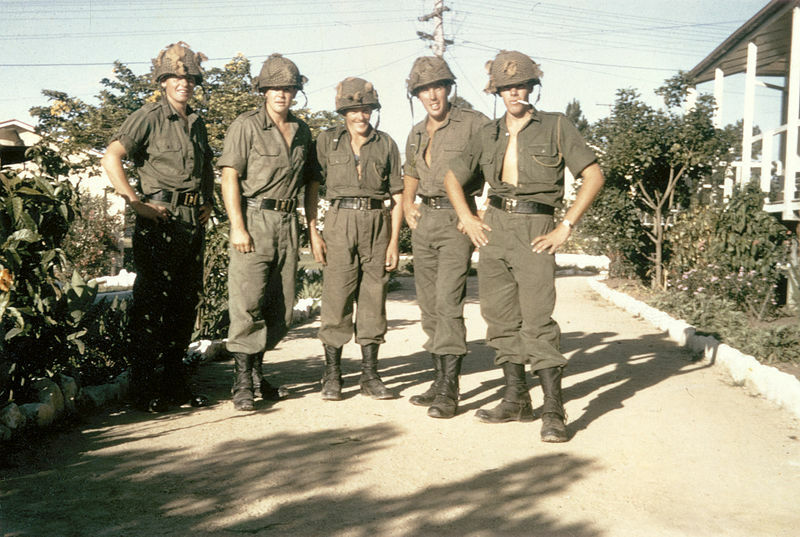 Five Australian soldiers assigned to 6 RAR photographed shortly before they and the battalion were deployed to South Vietnam in 1966. The initial battle of Long Tan began on the night of 16/17th August 1966 with a surprise mortar attack on the 1st Australian Task Force base. The mortar attack together with further intelligence reports (Australians had tracked a Viet Cong radio transmitter signal) indicated that an undetermined number of Viet Cong units were gathering nearby. A rapid Australian response was initiated, where a small company was ordered to search the surrounding Nui Dat Base. With the search operation commencing on the 18th, one hundred and eight men of D Company 6RAR, after relieving their mates from B Company continued the search patrol sweeping through a rubber plantation. It was at this point that D company made contact with a very large VC force. Surrounded on three different sides, D company opened fire and an intense firefight ensued. In next to no time, the sky opened up with a torrential downpour. The monsoonal weather created the most desperate of conditions with mud and thick mist blanketing the rubber plantation. In such poor visability, the battle raged for over 3 hours, in what must have felt like an eternity, as the troops of D Company fought for their lives against upwards of some 2,500 Viet Cong and North Vietnamese soldiers mainly from the D445 Battalion. 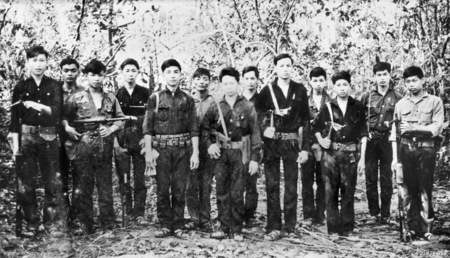 Viet Cong soldiers from D445 Battalion. The besieged D Company would soon be reinforced by the rest of the battalion as it mobilized itself. First B Company, then ‘A’ Company would arrive on scene. Strategically, ‘A’ Compamy arrived at a critical moment in the battle, on board armoured personnel carriers and attacked the Viet Cong on their flanks. This manoeuvre changed the completion of the battle forcing the VC units to retreat. Not until the following day, as the Australians swept back over the battleground did they actually notice how significant their victory had been. An estimated 245 Viet cong and North Vietnamese soldiers that had died in the bloody battle still lay where they had fallen. The Australian had suffered 18 deaths and had 24 others wounded. 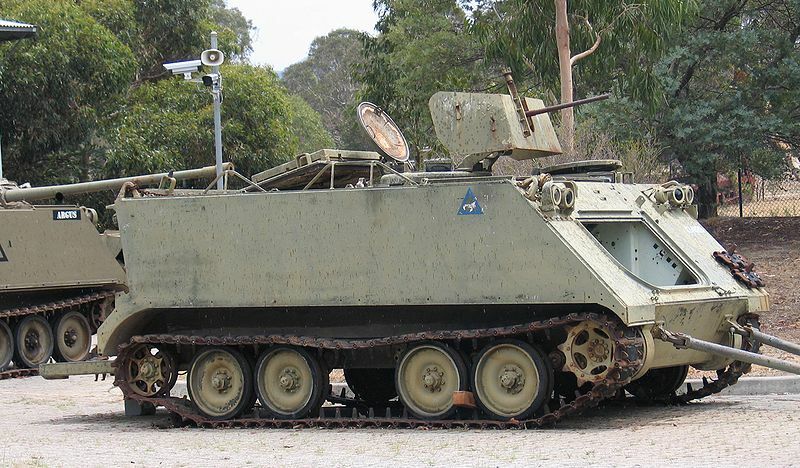 The above M113 Armored Personnel Carrier in the RAAC Tank Mesuem, Puckapunyal, Australia is similar to the APC used during the Battle of Long Tan. D Company would later be awarded a US Presidential Unit Citation from President Lyndon Johnson. Importantly, the contribution of other 6 RAR units should also not be ignored, nor the contribution of American artillery and RAAF helicopters. The RAAF crews were able to resupply D Company with ammunition which was crucial in being able to repluse VC attacks. Finally, the Battle of Long Tan reinforced Australia’s reputation as a modern skilled military force that had matured from its humble beginnings. Photo credit: The header image is part of the view of the rubber plantation, looking north east today, where the Battle of Long Tan took place. All images used are in the public domain. Here’s another terrific article from Robert Horvat’s blog which has been focusing on the experience of Australians in wars since the early 20th century. I didn’t even know Australia was involved in Vietnam, so I learned a lot here! Great stuff!